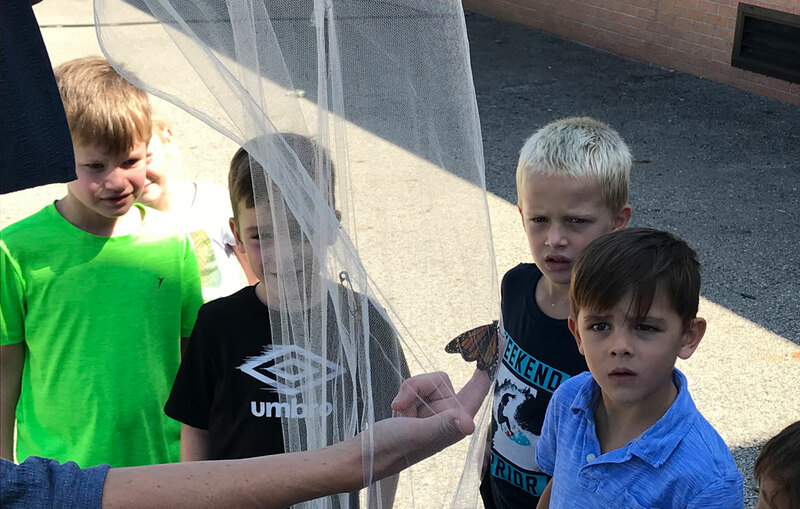 There is nothing like a 1st grade monarch release celebration, some of which is captured in today’s picture. The teachers and students know that I love to be present when the monarchs are set free. So I just came back in after 6 very excited 1st graders came blasting into my office to exclaim that they were releasing their final butterfly today! (Two others had escaped their net today, flying in the classroom, then flying out the windows after the screens were removed to allow their escape. What a day!) The journey is incredible from caterpillar to chrysalis to full-color Monarch butterfly. All of this growth and development is witnessed by the students in their classrooms. But, it is a very special day indeed when these monarchs are set free. The smiles, the expressed joy and wonder, the praise that is offered to God in the midst of it all is truly something to behold. The anticipation, exploration, discovery, awe, and joy reflected in these faces is the kind of attitude we seek to cultivate in all of our learning, in every curricular area at Rose Park and Holland Christian Schools. I’ll share more such images which capture this beautiful learning posture as we continue to move through our year. (Have you followed @principalrod on Twitter yet?) We are off to a magnificent start! As always, I pray that you may bless and be blessed this weekend with your families in rest, recreation, and in awe-filled worship. We are grateful to partner with you in equipping young and eager minds, nurturing soft and tender hearts, to transform the world for our Lord and Savior, Jesus Christ. It’s been a great first week, and we look forward to seeing your children again next week to love them and learn along with them. West Ottawa busing has began. All cars use the east drive only, coming in off from Butternut, and using the entrance to the parking lot closest to the strip mall next door, and exiting using the drive closest to Rose Park. We have designed traffic flow to be one-way only in this fashion. Buses only are allowed to use the west drive. Again, no cars should use the west drive before and after school. If you are dropping off a middle or high schooler for the morning shuttle, please park and wait in the parking lot, or simply drop them off in the drive to wait for the bus. We have added 10 newly striped parking spots along the sidewalk of the west drive. These are for staff parking only to free up more spaces in the parking lot for parents. When your car is in the loading zone area – please turn on your hazard lights UNTIL you have all the children in your carpool, then turn lights off. If your child does not see you or has not come to your car, feel free to ask staff on duty to help your riders find their way to your car. Please stay inside of your car. Do not allow your children to come to your car if you are not yet in the loading area. Please use the carpool plan whenever possible. If you must come and get your children from the sidewalk, please park in the designated parking spots and walk in front of the loading zone area, not between cars that are waiting in the carpool lanes. For a more complete explanation of our carpool, parking lot, and driveway instructions, please click and read this document. Whether you are new or experienced at Rose Park, for your convenience, here is a link to our Elementary Handbook found on the HC website. Please refer to the handbook for general information, or with specific questions you may have about life at Rose Park. You may drop off a check made out to Holland Christian to our Rose Park office and the funds will be added. click on Schools, then Parent Resources. Click on the Hot Lunch Tab. Set up a new account for your family. You will need your email address, and a password you would like to use. Your student’s ID number will be needed to link your child to your account. Please contact either our RP office for this number, or ask your child’s teacher. Please contact Carla or Diane in the RP office with any questions! It is imperative that you update your demographic information in PowerSchool now with your latest and most accurate contact information. Simply go in your browser to ps.hollandchristian.org, and, if you are a returning parent, log in with your personal log in and password. If you have difficulty, click the “If you are having trouble…” link to retrieve your log in information. If you are a first-time parent, you should have received already an email with your student’s unique access ID and password. (If you have not seen this email, dated 8/9/18, please check your spam folder.) Then, create a login for yourself. Click the “demographic change” button on the left of the screen. This information is necessary for field trip participation, emergency response and treatment, student photo permission, and for the office to easily be able to contact a parent or guardian as needed or desired. When listing your child’s emergency contacts, please be sure to list two contacts other than yourself. Again, please do this today to ensure that your child’s teacher has the most accurate contact information for you. The teachers do a lot of communicating with parents especially at the start of the year, and we want to make sure that you receive all of this communication. Thank you! Parents: if your child has a medical plan on file or takes meds at school, we need an updated form signed by their physician each school year. So, if you have not done this yet, please do so asap. You are welcome to contact our school nurse, Jane Borr (janbor@hollandhospital.org). She will help you set up a plan for the office to assist in administering the medication. For safety reasons, Holland Christian Schools is not able to dispense any medication (prescription or non-prescription) to our students without a doctor’s order. Thank you! This evening has become a family favorite, filled with good memories—even when it downpours! Picnic dinner and children’s activities, including bouncy houses, lawn games, and crafts, start at 5 pm, then the varsity football game against Byron Center begins at 7. The cost is $8 per person in advance, including both dinner and game, and tickets are available online at www.hollandchristian.org/alumni or at the HCHS or HCS administration offices. Or it’s $10 per person on the day of the event. Looking forward to hanging out! Special note for preschool & kindergarten parents: Save the date but don’t buy your tickets yet for this event. This night is our treat to you! More information will be distributed by your classroom teacher. TTQ is a fun, high energy program designed exclusively for boys in 3rd-5th grade! TTQ incorporates strength and stretching exercises with training for a 5K. Boys in this program will develop positive peer relationships and feel a part of a team while working toward individual goals. Additional practice activities focus on developing a healthy lifestyle, social/relationship skills, how to make healthy decisions, and being proud of who they are. * Practices last for 90 minutes immediately after school . Program includes the kick-off event, 18 practices, and the final event. * Included during practices: a healthy snack, games, strength and stretching exercises, and running. Please send water bottles and athletic clothes that are weather appropriate! * Final Event will be on November 10. Registration for TTQ boys is included in the program. Parents and friends are encouraged to participate. * Total Trek Quest is coached by adults who have completed program training, CPR/First Aid certification, central registry clearance and background checks. Coaches are always needed, please consider being a coach! * If school is cancelled for any reason, TTQ will also be cancelled that day. We would love to have you join us for our All School chapels on Wednesday mornings at 10:35 AM in the elementary gym. We welcome parents and friends to join us in worship as we discover how we can grow in cultivating shalom. For those of you really planning ahead, Rose Park’s picture days are Wednesday, September 19, and Thursday, September 20. More specific information and scheduling will come once we are underway through classroom and the Rose Park blogs. Welcome back Moms! Hope you’ve made some great summer memories. All Moms are invited to Moms In Prayer on Friday mornings in the Rose Park library from 8:15-9:05 am. Our first week back will be Friday, September 14. We’ll go through the four steps of prayer as listed on our weekly prayer sheet: Praise, Repentance (silent), Thanksgiving, and Supplication or requests. We have a section of time for you to pray scripture for your student and another Mom will echo your prayer. This is a powerful spiritual weapon for a Mom to posses. If you have questions please call or text Kathy Schut at 616-875-8912. God, may ________ take joy in doing Your will because Your instructions are written on his heart. The Kids Stuff Resale will be on Saturday morning, September 22 from 9-12 at Holland Christian High School. For more information, please email kidsale@ hollandchristian.org or call 616 820-2805.